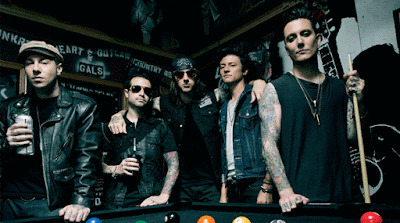 MetalRockNews: Atreyu's Brandon Saller is the new drummer for Avenged Sevenfold? Atreyu's Brandon Saller is the new drummer for Avenged Sevenfold? A month ago Avenged Sevenfold parted ways with drummer Arin Ilejay. The new drummer could be Atreyu's drummer Brandon Saller. Brandon is also the vocalist for Hell or Highwater and A7X frontman M.Shadows has worked with the band for the song "Go Alone" a few years ago. Brandon Saller has recently posted a photo with Avenged Sevenfold guitarist Synyster Gates. Brandon is a songwriter, drummer and vocalist, like former Avenged Sevenfold drummer Jimmy "The Rev" Sullivan, who died in December 2009. So, we think Brandon could be the perfect candidate for Avenged Sevenfold. What do you think? Avenged Sevenfold are working on the next album, due out in 2016.